A tribute outside the home of Liz and Katie Edwards. 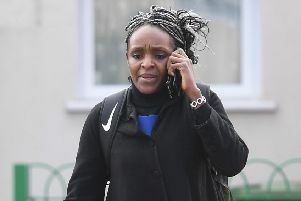 Two 14-year-olds accused of the murders of a school dinner lady and her 13-year-old daughter were this afternoon (Monday) remanded into secure youth accommodation following a hearing at Lincoln Crown Court. The girl and boy are accused of the murders of Elizabeth Edwards (49) and her youngest daughter Katie Edwards (13). Their bodies were found on Friday at a semi-detached house in Spalding. The teenagers were flanked by three security officers as they sat in the dock at Lincoln Crown Court. Neither showed any emotion with the boy appearing to fiddle with a piece of paper in his hand. During the five minute hearing they each spoke only to confirm their identities. Judge Michael Heath ordered that the pair should appear back in court on June 27 for a plea and trial preparation hearing. A trial date was provisionally arranged to start on October 17. The judge ordered that nothing should be published that might lead to the identities of the two accused being revealed. The bodies of Elizabeth Edwards, known as Liz, and Katie were found on Friday lunchtime at their home. Lincolnshire Police later arrested the two 14 year olds and over the weekend charged them with murder. A 14-year-old girl today bowed her head this morning (Monday) as she appeared in court charged with the murders of a school dinner lady and her 13-year-old daughter. The girl, who was dressed in a grey top and blue jeans, is accused of murdering Elizabeth Edwards (49) and her youngest daughter Katie Edwards, just 13. Their bodies were discovered at their semi-detached home in Spalding on Friday. She is jointly alleged to have carried out the murders with a 14-year-old boy who appeared alongside her in a packed court room number four at Lincoln Youth Court wearing a blue sweat shirt. The pair, who cannot be named because of their ages, stood in the glass-panelled dock flanked by security officers as the clerk of the court first asked the boy to confirm his name, date of birth and address. The girl was then asked to confirm her details before the court clerk read out the murder charges they face. Both defendants then sat as Jim Clare,representing the Crown Prosecution Service, gave a brief outline of the case. District Judge Peter Veits remanded the pair into the custody of youth detention and adjourned the five minute hearing. The pair will next appear at Lincoln Crown Court at 2pm today (Monday). The bodies of Elizabeth Edwards (49), known as Liz, and her youngest daughter Katie (13) were found on Friday lunchtime at their home in Dawson Avenue. Lincolnshire Police arrested the two 14-year-old youths following the discovery and charged them with murder over the weekend. Police remain at the scene at 5 Dawson Avenue, off Royce Road. A broken window which stood at the front of the semi-detached property on Friday has been removed.